Our beautiful Lindy, age 35, passed away peacefully surrounded by her family, September 14, 2012. Thank you for praying for her and our family during this incredibly difficult time. We celebrate Lindy’s homecoming and victory over her cancer battle, but we hurt so much. A funeral service to honor Lindys faith and life will be held at 6:30 pm, Tuesday, September 18, 2012, at Haven Christian Reformed Church, 541 Alice Street, Zeeland. The Rev. Art Van Wolde and Rev. Scott Van Oostendorp will officiate. Visitation will be 12:00-2:00 and 6:00-8:00 pm, Monday, September 17, 2012 at the Yntema Funeral home, 251 S. State Street, Zeeland. Burial will be in Zeeland Cemetery. Memorials may be made to the Ver Beek Children Education Fund (may be made at any Macatawa Bank). What a blessing she was to so many…Even those who never had the chance to meet her. im so sorry! My heart breaks for you, but rejoicing that she is in a place with no pain! Lifting you up in prayer!! Oh so very sorry to hear this. Praying for your family. so sorry for your loss. praying for you all. No more pain, a glorious forever with Jesus her Savior and you will all see her again someday! Praying for all of you to have the peace that only Jesus can give. Our hearts ache for all of you , May God surround you with His love and comfort . Continued thoughts & prayers ! I’m so very sorry! My heart breaks for you and the kids. I rejoice that Lindy has won the race, is doing the victory dance and hearing “Well done!” from her heavenly Father. Oh but the pain left behind for all those that love Lindy!! You are in my thoughts and prayers!! I am very sorry for your loss. My prayers go out to you and your whole family. I am so unbelievably sorry. I am not sure you remember me but I was one of the nurses that seen Lindy at your home. Her story touched me beyond words and I have often thought of your family. I am very happy to know that she is in a better place and smiling down on you all. Prayers coming your way from my family…. I’m sorry for your loss and am so grateful you have this blog to memorialize Lindy. She was an intrepid person with a great attitude—someone to emulate in her fight against such a horrible disease. I’m glad she is at peace but ache for your family. I know the hurt you are going through. So very sorry, Dusty, and heartbroken for you and the kids. We are claiming God’s promises like never before and know that like you said, we do not grive without HOPE. Praising God for Lindy’s LIFE…she touched so many people with her love, grace, and sense of humor. And we know she lives on with Jesus! We’re trusting God to heal the hurt and to carry you through this season of grief. Love and hugs to you! My husband and I are 27 and 30 yrs old and have 3 daughters. We have never met your family, we just happened to come across your blog and heard about your story in one of our Bible studies at church as we lifted you and your family up in prayer. My husband and I just read of Lindy’s going home to glory and we are both moved to tears. We just can’t imagine being put in your situation and it just doesn’t seem fair. It makes us upset to think that an ugly disease like cancer can steal away a wonderful wife and mother from a beautiful family, but we are also believers in an amazing and faithful God. He alone can give a peace that transcends all understanding and we pray that you will feel that peace right now in this moment. The faith and strength that Lindy showed through out this journey is amazing and such a testimony to her faith and love in her Savior. The way that your family just cherished every minute together and went ahead with an unbelievable amount of courage just sends shivers down our spines. 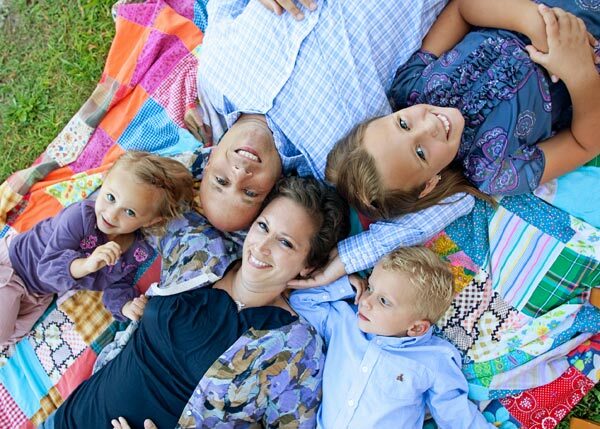 You are truly an amazing family and we thank you for sharing your story and your faith. May God bless you. Praying for your family Dusty. Thinking of Lindy puts a smile in my heart. Hugs to all. Lindy and I weren’t close, but I feel her absence, so I can’t even begin to imagine what your family is going through. I looked around this afternoon, watching so many people just going about their normal day, and all I could think about was your family and how it must feel like the world ended today. Please know that Lindy changed many lives and that she will not soon be forgotten. Praying for you all. My heart breaks for you. Thankful that she is no longer suffering. Thank you Father for Lindy, for her faith and strength she has shown all of us through her battle. Please comfort this family and may they be filled with Your peace now and the years to come. Praying for you, asking God to walk with you during this difficult time. I’m so sad for you and your children. It’s so hard to understand something like this. I’m praying for all of you. I am so sorry. Your family helps me deal with y battle. Her humor, strength and love is something i strive for through these very difficult times. I have less fear through my own race towards the finish line. Jesus brought her to her home. she’s’ probably speaking with Him now with that wit of hers. I am so sorry for you and your childrens loss. I will always remember the vibrant young Lindy that I once knew. May God shed his grace unto you all. Beautiful describes her perfectly. She was a blessing to our family and many more for 35 years. She will be missed. LIfting you all up in prayers during this difficult time. Praying you may feel peace that passes all understanding. Praising God that she has won her eternal victory and is whole and perfect. May the Father of compassion and the God of all comfort hold all of you, Lindy’s wonderful family and dear friends, in His everlasting arms. Lindy is Home–but, oh, the grief for those left behind. Abundant prayers for grace and strength as you get through these first days without your beloved Lindy. Our family grieves with you and your family, Dusty. May you feel uplifted and surrounded on these really tough days. We will continue to pray to our Father to lift you up at just the right times when things settle, and you and the kids begin the road of coping with such an uncomprehensible loss. We are all behind you Dusty. Our thoughts are with you as you walk this difficult path. I trust in God as sovereign yet I have many questions which I hope will be answered someday. Hoping that the love of friends and family provides peace to you and the kids. Our prayers and thoughts are extended to you Dusty and family. This life on earth is so temporary. This is not our home but there are so many questions that are unanswered at this time. We are praying for the arms of Jesus to be around you as you walk this road. May His comfort be around you all now and in the future days. Psalm 116:15 Precious in the sight of the Lord Is the death of His saints. We are mourning with you….crying with you…..we are so sorry Dusty. We will continue to pray for The Comforter to be with you every minute. Praying for all of you at this time. Dusty, I’m so sorry for you and your family. There’s really nothing more for me to say except that I’ve been praying for you and your family for some time, and I won’t stop now. Lindy will always be remembered as someone who packed 70 years of life into 35 years of living by her vibrant smile, her sparkling eyes, her humor that always lifted our spirits , her love for her family and others that was deeper than the ocean, and her unwavering faith that constantly persevered. And now she shares all that with others in Heaven. Heaven is a better place because she is there. We are better people because she was here. We will miss her more than the groaning of our hearts can express. She awaits for us with joy more full than Heaven can hold. Until then, we are one in the Spirit, embraced by the arms of God Who heals all our diseases. Our prayers for all your family will never end, and our love will always embrace you. Oh Dusty, I just can’t believe she’s really gone…my heart hurts so for you and the kids. Please know that we will continue to lift you up in prayer that Jesus will be so close to you now through this extremely difficult time. We love you and the kids so much! You don’t know me, but I’ve followed your blog for a long time. Your journey has touched my life & all I can say is I’m so sorry for you and your precious little ones! I will continue to pray for all of you in the days to come! GOD bless you all! Dusty, rejoice in the fact that Lindy left you a legacy in your three precious children. As they grow, evidence of Lindy’s influence will constantly show to your delight. Our perfect Lord has an exciting plan for each of you and with the absence of Lindy you will see the promise of Romans 8:28 fulfilled. Dusty, you have a whole army of believers praying now for you and the children, waiting for you to call on them for assistance in all areas needed. You are so special and the dedication to Lindy’s care did not go unnoticed. Now it is our turn to serve you in any way we can. So sad to hear this, never easy to walk thru! We will be praying for you and the kids as you travel this difficult road! May you be blessed with many good memories and may God give you peace and rest that cannot be understood! You are an amazing family! Our whole family is praying for all of you. May you find peace and feel Lindy’s presence in your hearts every moment. My heart hurts for you and your family, Dusty! Your family will be continue to be in my prayers. May you have peace that passes all understanding in these incredibly difficult times. I do not know your family, but I was so moved by your blog. Cancer has played a significant role in the lives of some of my loved ones as well. Know that you are being lifted up in prayer by so many, even complete strangers! May you be comforted by our loving Savior and rest assured in His promise of eternal life. I don’t know your family and only recently heard about Lindy. And now it doesn’t seem fair that she is gone. I will keep you and your family in my prayers. I thought about your family all day today, I just cannot imagine the pain. But so glad for you that you and Lindy are believers and that she sits at Jesus’ feet now. I just read the book ‘Heaven is for Real’ and I’m sure you and the kids would find it so encouraging to read. Thank you for sharing your story and I know Lindy’s legacy of faith will continue to change the lives of others. Dear Dusty and Family, We pray that your hearts may be held in Gods hands and that you are covered by His strength and peace at this time. We can rejoice that Lindy is with her Heavenly Father with no more pain or tears. She has victory in Jesus. God bless you and keep you! Thank you! That may seem like a strange thing to say, but thank you for sharing Lindy with all of us, for trusting that God has a bigger plan even in the midst of pain and loss, for showing so many men how to adore and care for their wives til death do you part…and beyond, and for being an incredible witness to your love for your Savior! My prayers are with you and the rest of your family. Lindy didnt enter my world until today. After reading the notice of her passing, I poured a cup of coffee and went back in time to her very first entry. The whole pot is gone now, my heart is both broken but also calm with a quiet love and admiration. She is a beautiful spirit. Godspeed Lindy. Just finished reading the entire blog. I am soooooo very sorry for your loss. I found her story to not only be encouraging but inspirational as well. There is a God that is bigger than anyone can imagine. I have found renewed faith through your story. You and your family will be in my thoughts and prayers through your time of need. so very sorry for your loss. the fight of lindy and your family is inspiring, and you’ll be in my prayers. Our thought and prayers go out to you, Dusty and your kids and family. May you feel God’s presence during this difficult time. Will continue to pray for your family. She’s home and she’s whole again. Our prayers will hold you close, Dusty, Brooklyn, Samantha and Maxwell. I never had the chance to meet Lindy, except through her blog, but will look forward to knowing her in heaven. It seems that in both her living and her dying, she had such dignity and grace, and lived to bring glory to God. Although your loss and grief are palpable now, how encouraging it must be for the family to believe the promises of God, and to know that you will see her again. It won’t be long before “death is swallowed up in victory” (I Cor 15:54). My prayers are with you in this time of grief and loss. Bless you and Lindy for sharing her journey and your family with your blog. What an amazing woman of courage, grace, determination, and faith. Praise God Lindy’s pain and struggle is over and she is at peace with our Lord. May God wrap his arms around your family in comfort in the next days, weeks, and months ahead as you adjust to life without your beloved Lindy. He will be there to lift you up always. God is constant and never fails us. My deepest sympathy for your loss. Our deepest sympathy to you and your family, we will be keeping you in our prayers during these difficult days to come. Lindy touched the lives of many and I am sure her work has just begun as a “special angel” of our Lord. I didn’t know Lindy personally, but a good friend of mine, who is also a friend of Lindy’s, passed on your family’s blog about 18 months ago. Ever since, I’ve followed your family’s struggles and triumphs. I am 38 years old with 3 young children so could easily picture our family in similar circumstances. The grace, faith, openness and honesty that Lindy displayed was absolutely inspiring and has touched me deeply. May God bring peace to your children, you Dusty, and all those who knew and loved Lindy. Know that she, and your whole family, has touched many who have never even met Lindy or your family.